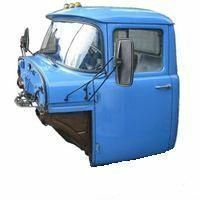 on the body may include: the driver's cab, hood, trim, fenders of the front wheels, mud flaps, rear wheels and a platform for goods, having the structure regardless of the transported goods. It made of sheet steel and comprises two doors and seat. The cabin is set all controls and equip it visors, wipers with washers. The platform has flaps which are connected to the floor by means of hinges. The sides of the closed position are interconnected by means of locking devices. The platform floor is collected on 2 several longitudinal and transverse bars. The longitudinal beams are fixed ladders on the vehicle frame. Cab Zil-130 <. p> Made of closed type, with three places, two-door. Closed booths welded prefabricated housing major components such as a side panel, roof panel, rear and top panels and frame. Rigidity of the panels is achieved by the use of ribs of different shapes: in the cab frame - closed box-shaped cross-section, which are formed by connecting panels after welding, the roof - its domed shape .